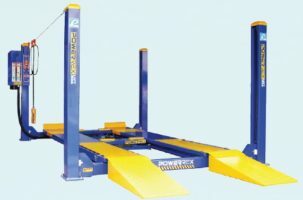 Asymmetric arms, tool trays, remote control, manual lock release. 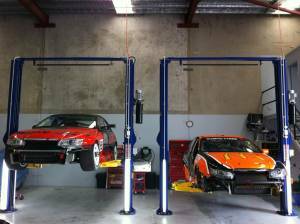 The hoist can be assembled at two different heights. We recommend the highest setting if possible. 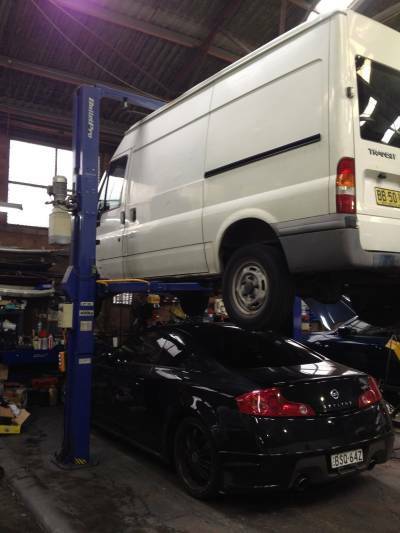 This way a 4WD or high roof van/ute can be lifted without the operator having to bend over to work. The rams locate into the base of the hoist rather than bolted into the top of the hoist post. 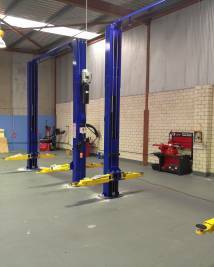 This means all of the weight of the vehicle is distributed through the workshop floor. This design means the post is used for stability only rather than lifting plus stability resulting in a much less stressed post. Automatically deploying arm locks. 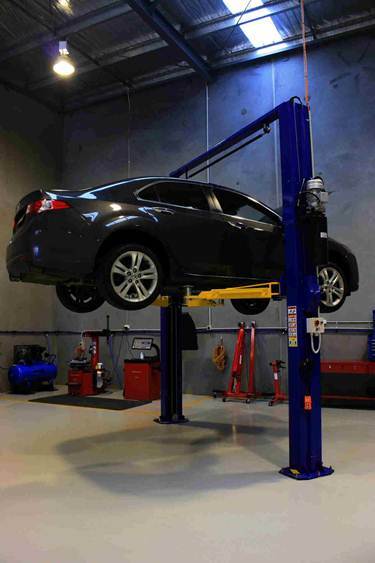 The arm locks are made to prevent an arm from being dislocated and allowing the vehicle to fall off of the hoist (the most common way a person gets hurt under a hoist is if an arm lock fails or more commonly if one is overidden or disengaged and then forgotten to be re-engaged). 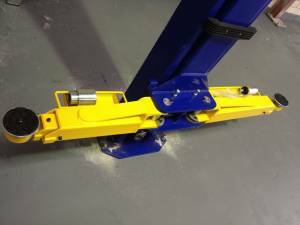 Our hoist arm locks are of a block design which prevent the locks from being permanently overridden. They can be manually overridden but automatically re-engage as soon as they are let go. 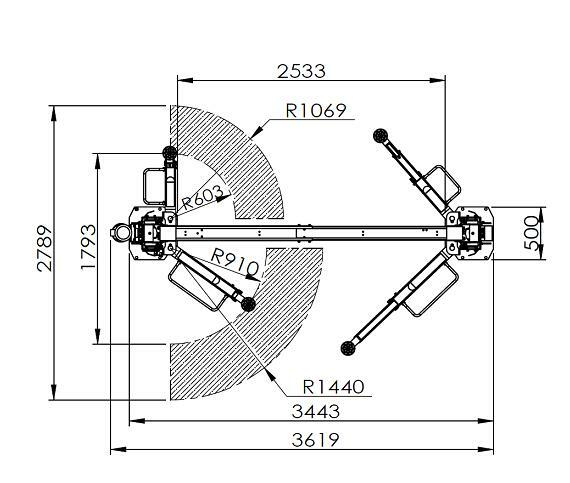 The arm locks automatically dis-engage when the hoist is fully lowered to allow easy arm positioning or removal. Padded roof bar stops the hoist from raising if it is touched. It takes very little effort to trip this switch. 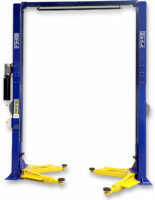 It stops roof racks or high loads from being crushed under the top bar. 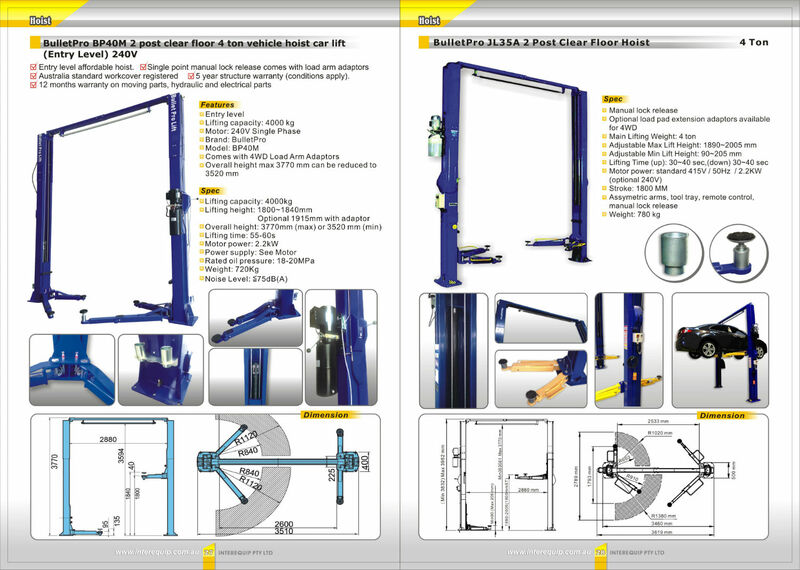 Triple telescopic expanding front arms with double telescopic rear. Each arm has its own tool tray built in. Now you’ll always find that nut, bolt or spanner. 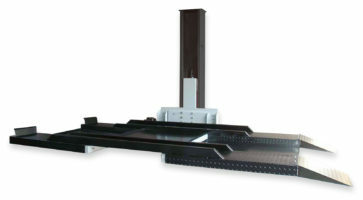 The lift pads are a combination of “drop in” and adjustable. They feature a double telescopic thread to allow the pad to get as low as possible. 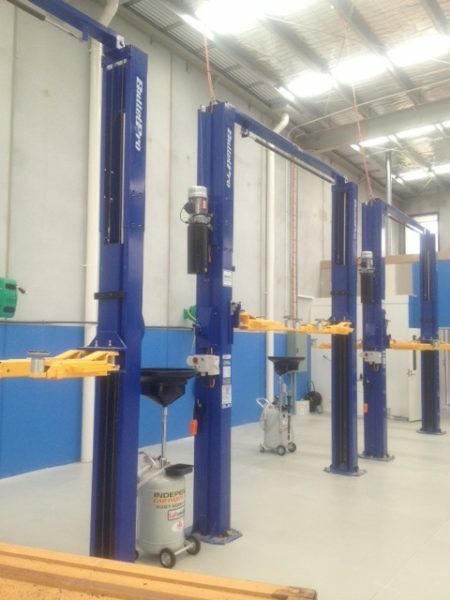 We also supply as standard the 4WD adapters to ensure the lift arms can reach the vehicle chassis without damaging side steps or the vehicle body. 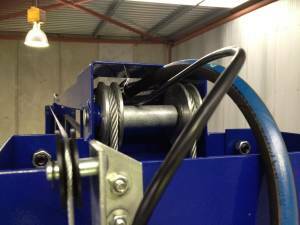 The hoist is supplied with a three phase motor but is available with a 240 volt motor at no extra charge. The power pack features a metal oil reservoir to ensure it resists physical damage as much as possible. The oil level is checked via a dip stick. To raise the hoist simply press one button. To bring it down simply push one lever. 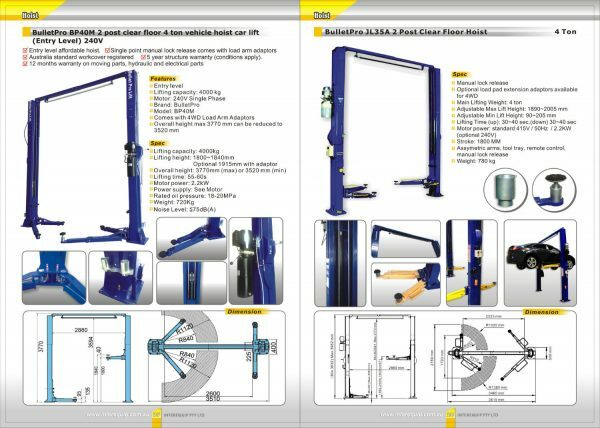 The single lever firstly releases the locks then brings the hoist down – one hand operation. 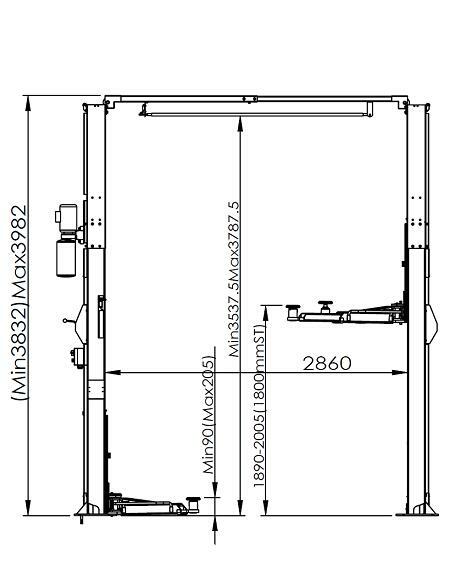 We prefer this style of lock release as it is simple and has minimal moving parts. When compared to electric release locks there is no need for a voltage transformer, electric solenoids, or dedicated electronic boards. 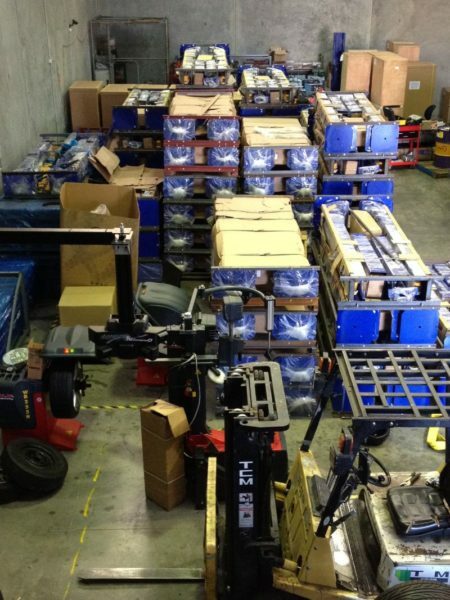 All electrical parts are locally available. There are no electronic boards. Supplied with a remote control to make lining things up much easier with one person. The remote control does not release the locks so it is impossible to let a car down on top of you. Over 5,000 units sold across Australia. We have stock available and full time support staff in Brisbane, Sydney and Melbourne. Please ask for freight prices to other capital cities.